Pastor-Satorras, R.; Rubí, J. M.
We present a new model of sequential adsorption in which the adsorbing particles experience dipolar interactions. We show that in the presence of these long-range interactions, highly ordered structures in the adsorbed layer may be induced at low temperatures. 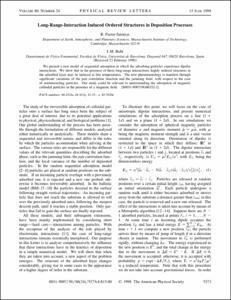 The new phenomenology is manifest through significant variations of the pair correlation function and the jamming limit, with respect to the case of noninteracting particles. Our study could be relevant in understanding the adsorption of magnetic colloidal particles in the presence of a magnetic field. Pastor-Satorras, R., Rubí, J. M. Long-range-interaction induced ordered structures in deposition processes. "Physical review letters", 15 Juny 1998, vol. 80, núm. 24, p. 5373-5376.